The 3rd day of the conference. Dr. Richard Moore: “Come up Higher”! The wave of the reverent presence of God overwhelmed the whole hall at the beginning of the first service. The rivers of Heaven were poured upon all present people with healing, renewing, recovering, rising to a new level. Dr. Richard Moore was introduced by Pastor Henry, as the speaker of the conference service. Dr. Richard Moore emphasized the fact in his sermon that among Christians there are often two problems. 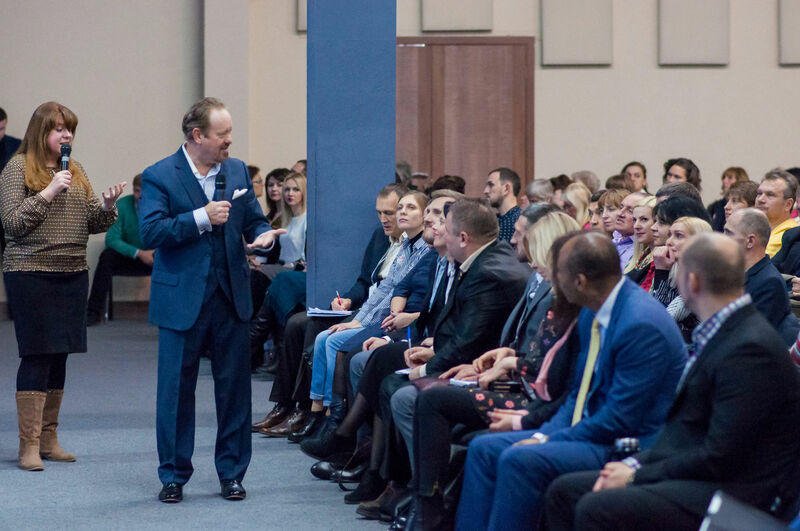 One of them, when people do not know who their Father is and when they talk about sickness, illness or financial problems, they do not have the revelation that God is more than enough. The second problem is the mentality among Christians: "If God wants, He will arrange and do everything by Himself." Dr. Richard called - "Make a decision today to do great things! If you do something, do something big. He is not the small God that supports us, but He is larger than life! The whole power of Heaven is with us, so much power that you can shake the mountains." "We are the Body of Christ, called to reign and rule, form and shake the nations to produce powerful works." "The very moment when you realize who you are, understanding that God has redeemed you, you’re becoming the part of the divine nature, washed by the Holy Blood of Jesus Christ. Your life will be changed, and all people who will be in contact with you, will be transformed." Now is the time for the Church! It is the time to stop thinking about the limitations. God can do more than we can ask or think about. The preacher also paid special attention to the impact the words have, the spiritual law, which is activated by our mouth, according to the Galatians 6: 7. "Do not be deceived, God is not mocked; for whatever a man sows, that he will also reap”. This is a spiritual law from which we cannot get away. How can we get away from poverty and poorness? Through proper confession and offering. So you can pave the way from poverty and debts to prosperity. In such way the law of blessings works. We are allowed to see what we say. We will have what we believe in, what we expect and what we say. The main thing is that we are filled with the faith of the Mighty God, full of the Holy Spirit, full of determination to act and do great works.